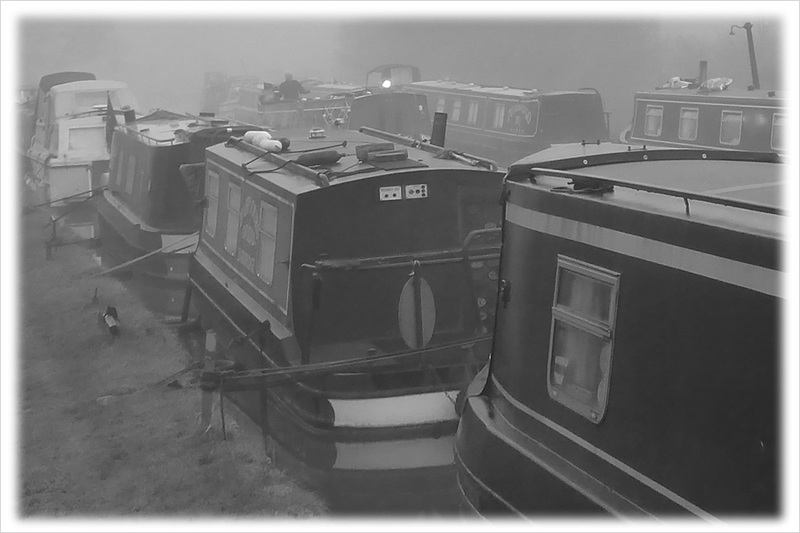 One misty, moisty morning, when cloudy was the weather #England #narrowboat – The Diesel-Electric Elephant Company. Bit of a theme going on here, for which I do apologise. The world in monochrome. Simpler days, less of the rainbow bling of colour. I love trees at the best of times, but there’s a very different element to them in winter. The trees are, for the most part, sleeping, and if they’re not then they’re doubtless wondering why this peculiar mammal is bothering to be out and about when there’s so very little of the sun to feed on. Humans must seem to be such very odd creatures, to trees. Humans certainly present as very odd creatures to me, and I can’t be a tree – I’ve tried. I find it tediously constricting to be able to be only one species. How much more fun it would be to be something else at whim. Look at me – I’m an oak! Look at me – I’m a squirrel! Look at me – I’m a dodo! * Look at me – I’m stuck with just being a human. Ever wonder why the “me” that makes me me and the “you” that makes, putatively (I have yet to see credible evidence), you you is parked in one place with no capacity to move about? It can’t just be that everywhere else is taken – I’ve tried being a fence post, a paving slab and a news-reader, and none of those are sentient (as in “already taken by an id“). Hell’s bells and buckets of blood, there are fewer objects with larger “vacancy” signs, so why can’t I move my mind in? Whatever the scientific cause of the limitation – Sodbucket’s Third Law of Consciousness, or Ezekiah’s Decree to the Carpathians on Mount Fukushima, or some such – how much more interesting might it be if we could take a flying leap with our mind, and dive into a railway line and zip along it from station head to station toe? Perhaps see the world as a cloud might see it, or even just be a nice rock for a while? Maybe burrow into the soil and enjoy being a field for a day? Squeeze myself into a roadway cat’s eye and spend the day looking out, cross-eyed, at tarmac level and waiting for the first tyre to run over me, just to see what it feels like popping back up again unharmed? This business of only being able to be me inside me and – worse – only me in the here and now instead of scooting back and forth through time, at will and whim, is such a dull and dreary design flaw of the human condition. I blame Mr Nature and Mr Darwin in equal part. Lost in time, and space, and meaning. Lost in more than just the mist. Oh bugger. The neighbour’s “small but perfectly-formed jet engine” heating has just come on, as it does each and every morning, Monday to Sunday inclusive, and while it runs all that I can hear are hydrocarbons caught in flagrante flaming combustio. No more peace and bird-twittery quiet for me for a while then. No more gentle sound of the logs crackling in my stove. Just to emphasise the point the nuclear waste train has just thundered past, two engine units, two flat-bed wagons with one huge flask each. Cheshire must positively glow with this cr*p. It’s all stored in the caves left by the salt mines, I kid you not. I suppose that even if I could be a rock some bar steward would fly-tip household rubbish on me. Ho-hum. Life is a very peculiar thing, a very peculiar thing indeed. Back to being a hooman it is then. *Seriously, I do sometimes wonder, but there’s never a mirror around when I need one, and the “dodo” element may just be my psyche anyway, and not the fleshy envelope. These photographs are stunning! The trees; the mist; the water….everything! Magical stuff. I just read your guest post about canal life on The Story Reading Ape, and am fascinated. Whilst here in Australia we do have lovely waterways, they are generally of a natural nature ( which is lovely, of course- not complaining..), and the landscape is obviously quite different. We do have a *few* canals, but nothing like this. Mainly just very modern ones built for ugly estates, for people with too much time and money on their hands to park their ugly powerboats upon. I’d love to go exploring the canals you have over there. Living on a narrowboat ( or any boat) must be quite an inspiring lifestyle for a writer. Anyway, thanks for sharing your experiences ( and wonderful photos! Please post more of those!). Ah, Pat McDonald, drop a link so I can find yer on the interwebs! Ah, Ian, I love the way yer mind wanders, me lad! If I could but be an unladen swallow, I would wing me way to Old Blighty and crap on yer neighbor’s yardarm. Then I would stop into The Cardinal and mooch a cuppy tea and a sticky bun from you, old salt. Alas. Alack. Welladay. Ah, the melancholia of the misty morning has set in; methinks the trouble with hoomans is we think too much. That leads to inventing stuff that spoils the wonders of the naturals. Maybe a cats eye is quite content and doesn’t think about being a hooman driving over all its buddies. And maybe that’s why writers write stuff about being able to fly (like the wondrous Gift series J P Mclean} that leads me to examining the world from different perspectives. And here we are the faithful fans waiting for the next exhibition of nature captured only as it can be by your good self. Take a hip flask and be damned! Splendid once again! As you allude, existential angst is rarely seen among rabbits, cattle and other, higher, forms of life than mankind! I do have to say though, a hip-flask is a ruddy good idea! Seriously, I’m not driving a car, and there are – as yet – no breathalysers on the canals… I am going to take your advice in the matter!